According to a survey from the National Retail Federation, parents spend an average of $670 on school preparations for a single child each year.1 With August right around the corner (it’s one of the best times to buy supplies! ), we’ll show you how to cut back on that number. 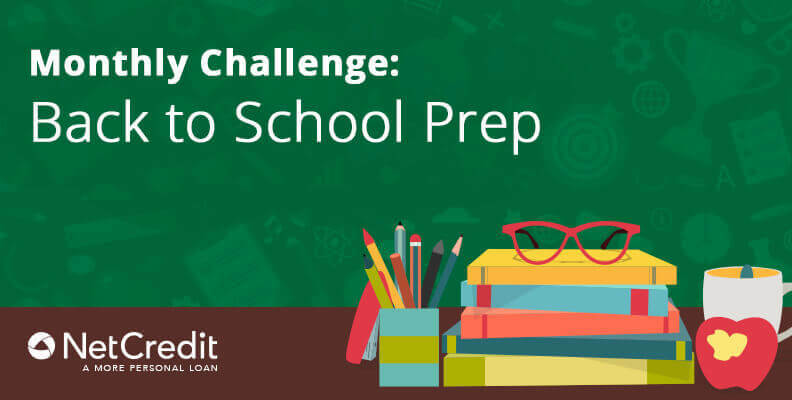 Find out how to save on the essential supplies your child needs for their upcoming school year in our latest monthly challenge. Read and re-read. Double-check the school supply list provided by your child’s teacher. If you won’t receive a list from the school, use one of these back-to-school shopping lists. Make sure you understand the items on the list before you go shopping. If you end up purchasing the wrong calculator and are unable to return it, that’s money lost. If you can return it, it’s time lost. Preparation can save you in both cases. Take inventory. Do you need all of the items on the list or are there items left over from last year? Avoid doubling up on items on the list that are still in good condition and can be used again. Set a back-to-school budget. Once you’ve set it, spend it wisely. There may be several things on your shopping list, but does your child need it all right at the beginning of the school year? Purchase things your child needs right away (anything on their supply list) and save additional items (snow pants to play at recess, new clothes, etc.) for your next paycheck. Look online first. Set the benchmark by establishing your “beatable” price at your favorite online retailer. Take notes on the prices you find for each item. Then explore the ads in the newspaper or go to the store. Compare prices between online and in-store and save! Host a school supply or clothes exchange party. Do you have friends with kids around the same age? Your friend’s son no longer needs his ruler or project supplies for third grade, but his little brother needs art supplies for second grade. Luckily, you can swap your kid’s second grade supplies for your friend’s son’s third grade supplies. If you have enough to choose from, you can save a ton! Save a dollar, spend a dollar. Visit your local dollar store for the basics like scissors, staplers, pencils and more. Don’t let new tech break the budget. When buying new technology, consider buying refurbished. You can save anywhere from 15% or more on pre-owned items like computers and tablets. Use online couponing to save big. Check Groupon for deals on school supply kits. Groupon frequently shares coupon codes for an even bigger discount on top of their usual sales. Plan Ahead. Making breakfast while you pack lunch is a lot to fit into your morning. Prepare lunches the night before or make extra servings of dinner and save the leftovers for lunch the next day — one dish, two meals! Expedite your morning. If you always seem to be running out the door and skipping breakfast, try one of these easy breakfast options to grab on the go. Avoid unhealthy school lunches. Cheeseburgers, pizza and fries, oh my! School cafeterias have many tempting unhealthy options for your kids. Save more by preparing food at home and setting an example of good food choices. Try one of these quick and easy school lunches. DIY to Save. Don’t waste money on disposable paper bags. Instead, make one of these easy-to-sew reusable lunch bags! Focus on quality over quantity. Basic pieces that can be mixed, matched or accessorized will give your child a lot more to work with and will help decrease the frequency that you need to shop for something new and trendy. Prioritize style items that will last awhile. Kids are always growing! If your child really wants a new look, consider getting accessories (something they can’t outgrow). Think layers, too! By next summer, your child may not fit into that T-shirt, but if you pair it with a cardigan or sweater, you’ll extend the wear time by a few months! Sell old clothes to buy the new. Check out sites like thredUP, where you can sell the clothes your child has outgrown for cash or for store credit. Save by the season. While the best time to buy school supplies is August, clothes are better saved for October when the seasons change and retailers have to make room for next season’s styles. If you can hold off, hit the clearance racks around mid-October. Consolidate your schedules. Purchase or print out a free calendar to keep everyone’s schedules in one place. When you’re in a household with multiple schedules, it will be helpful to keep everything straight to optimize transportation, dinner plans, etc., especially when extracurricular activities are in play. Practice your route. A day or two before the big yellow bus arrives, do a trial run of a typical morning. See how long it will take to pack up lunches, get ready, have breakfast and walk to the bus stop. Also note when people overlap in the bathroom or kitchen and whether you can better organize your morning routine to avoid overcrowding in any one particular room. Assign an “inbox”. Use it for any announcements, permission slips or other important paperwork to be delivered upon arrival home so that it doesn’t get lost in the chaos of homework. Buy in bulk. Common supplies like paper, notebooks, pens, etc. are likely to show up on your kid’s list for next year, so save up! This strategy costs more up front, but you’ll save time and avoid stress next year. Shop strategically. Shop year-round to help spread out the cost over time versus loading it on all at once. Wait for sales and only purchase supplies you’re confident your child will need the following year.